Salt Lake County’s top law enforcement leader enrolled in the police academy after firsthand experience with racism. (Francisco Kjolseth | The Salt Lake Tribune) Rosie Rivera is the first woman in Utah to serve as any county's sheriff after being sworn in on August 15, 2017. 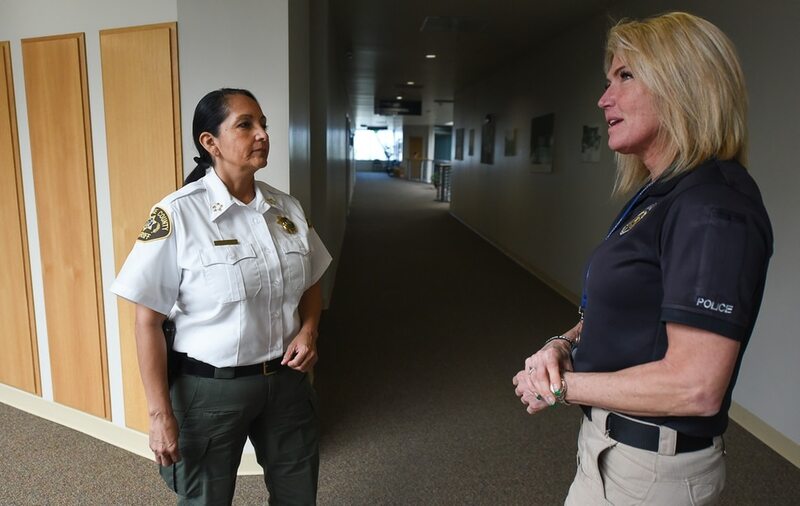 (Francisco Kjolseth | The Salt Lake Tribune) Rosie Rivera, left, the first woman in Utah to serve as any county's sheriff speaks with Sgt. Jodie Sampson at the Salt Lake County Sheriff's Office Building in Salt Lake City on Monday, Dec. 11, 2017. (Francisco Kjolseth | The Salt Lake Tribune) Rosie Rivera, the first woman in Utah to serve as any county's sheriff walks the halls of the Salt Lake County Sheriff's Office Building in Salt Lake City on Monday, Dec. 11, 2017. (Francisco Kjolseth | The Salt Lake Tribune) Rosie Rivera, the first woman in Utah to serve as any county's sheriff speaks with Unified Police Officers at the Salt Lake County Sheriff's Office Building in Salt Lake City on Monday, Dec. 11, 2017. (Francisco Kjolseth | The Salt Lake Tribune) Rosie Rivera is the first woman in Utah to serve as any county's sheriff after being sworn in on August 15, 2017. 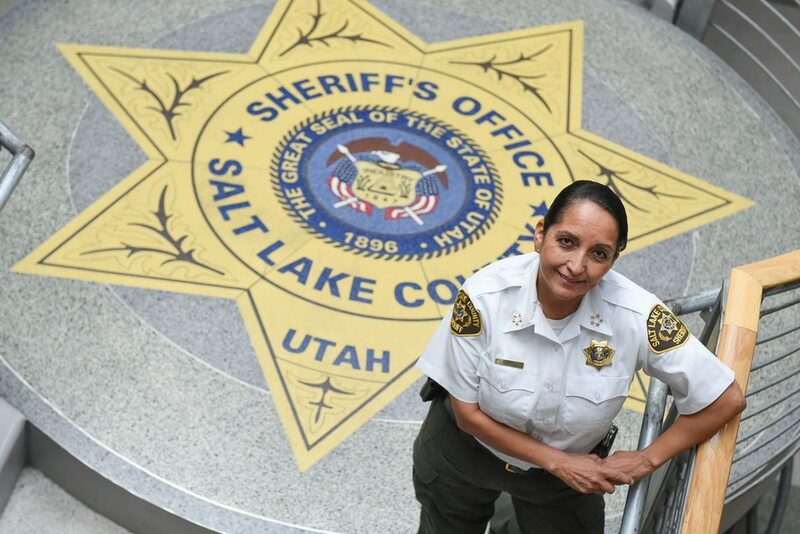 (Francisco Kjolseth | The Salt Lake Tribune) Rosie Rivera is the first woman in Utah to serve as any county's sheriff after being sworn in on August 15, 2017. 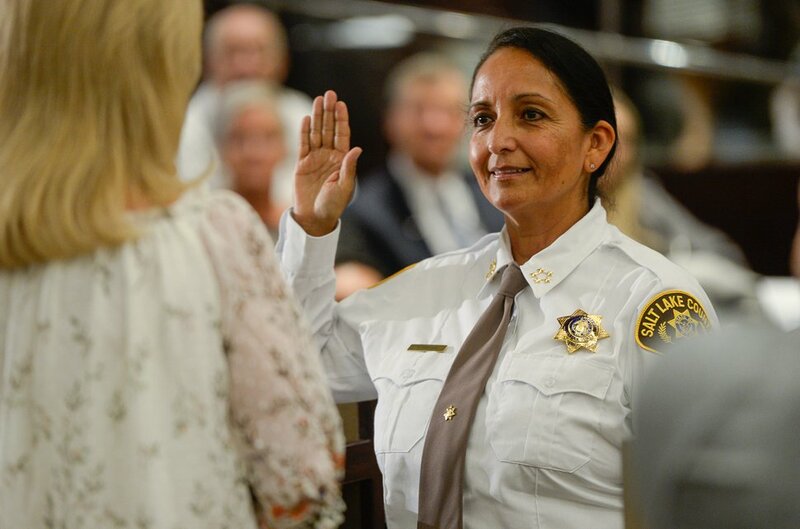 (Francisco Kjolseth | The Salt Lake Tribune) Rosie Rivera is the first woman in Utah to serve as any county's sheriff after being sworn in on August 15, 2017. Rosie Rivera’s life story seems a little like the plot of a TV movie. You know the one: That improbable tale of a teenage mom and high school dropout, who lived on public assistance, but didn’t let the stacked-against-her odds keep her from fulfilling her dreams. But it really happened that way. In August, Rivera, 55, was named Salt Lake County’s sheriff — the state’s first female sheriff and only the second Latina in the country to be elevated, or elected, to such a post. It’s an accomplishment not easily earned for the mother and grandmother who once worked the onion fields to keep her young family fed and went to the police academy at a time when some recruits around her questioned whether women should even be wearing a badge. If the past is any predictor of the future, then it’s probably no surprise that Rivera, who grew up in Layton, finds herself the sheriff of Utah’s most-populous county. (Francisco Kjolseth | The Salt Lake Tribune) Salt Lake County Democrats who chose Unified Police Deputy Chief Rosie Rivera to lead the state's largest law enforcement agency is sworn in as county sheriff at Salt Lake County Chambers on Tuesday, Aug. 15, 2017. Rivera becomes the county's first female sheriff and the only woman overseeing a sheriff's office in Utah. As a kid, she was a self-described tomboy — usually clad in cutoffs from a Boy Scout uniform; her pockets full of marbles — who followed the rules set down by a strict father. Rivera — the second of four children, who wore thick glasses, loved television police dramas and always had her nose in a book — was the family cop. “I was always was the one that wanted to make sure nobody crossed the line,” she said. But, at 14, it was Rosie who got into trouble, pregnant by her 16-year-old boyfriend, Rick Rivera. She was in the ninth grade and not even sure how it happened, she said. Before they could blink, the teens, were being hustled off to Idaho to get married because Utah law wouldn’t allow the marriage. It was, Rivera said, the logical step in a Catholic family with roots in Mexican culture. While her husband worked and went to high school, Rivera finished junior high and tended their son, Damian. She tried to attend high school, but dropped out and went to work alongside her in-laws picking onions to earn money. By 18, she was working in a cotton-ball factory. At 19, she had a second baby, a boy named Ricardo. From there Rivera got a job at Hill Air Force Base, where her father worked. She first drove a garbage truck and then a forklift before signing on as an apprentice electrician. After six years at Hill, Rivera was hungry for more and debating whether to join the military or pursue a law-enforcement career. It was a family camping trip that sealed her fate. An unruly kid on a dirt bike drove into the campsite, harassing the family and making a mess. When Rivera’s father and uncles couldn’t run him off, she said, they called the sheriff. The incident ate at Rivera, she said, because it cut against the way she believed people should treat one another. And so, as soon as she could, she enrolled in the police academy, with the full support of her husband and family, which by then had grown to include an infant daughter, Bernadine. (Steve Griffin | The Salt Lake Tribune) Salt Lake County Sherrif's detective Rosie Rivera when she was the Law Enforcement Officer of the Year in 1999. (Tribune file photo) Taylorsville Chief of Police Larry Marx and Detective Sgt. Rosie Rivera appear at press conference in 2006. Rivera was 31 and one of only five women in her 1993 class. Her first job was with the Weber State University police, where she worked for about a year before applying for a job with Salt Lake County. At the time, there were nine women in the department of roughly 300, but Rivera had made an immediate impression during an interview with then-Sheriff Aaron Kennard. Rivera also had a strong work ethic, listening skills and calm demeanor, he said. All were clear assets to the department. Rivera’s warmth, leadership style and slight frame — she’s 5-foot-3 — however, should not lead anyone to think she’s isn’t tough, Kennard said. She holds a black belt in taekwondo and could easily put any belligerent suspect on the ground. Minus a two-year stint when she helped build a new police department in Taylorsville, Rivera has worn the Salt Lake County — now Unified Police Department — uniform. She started as a patrol officer in Riverton, where she moved her family, and worked her way up through the ranks serving as the county’s first woman on the Metro Gang Unit in the late 1990s, as a detective and supervisor in the violent crimes and sexual assault units and as PIO. In 2015, Sheriff Jim Winder promoted Rivera to be one of his division police chiefs, the first woman to serve in such a post. In the beginning, Rivera worried about whether her male colleagues — all of them seasoned officers — would accept her. It wasn’t a problem. She also got some good advice: Be patient. Don’t have an ego. And don’t try to be a man. Retired sheriff’s Lt. Dave Burdett worked alongside Rivera at the beginning of her career and said she earned the respect and trust of her fellow officers partly by being a dependable and competent colleague. At times, Burdett said, he heard some grumbling from male officers about having a woman in the ranks, but if Rivera was feeling any strain, she never let it show. Harder, maybe than many may know. While a full-time deputy, Rivera also was a part-time security officer for the Huntsman Corp., studying between duties there to earn her bachelor’s degree in business management. The degree helped her advance to the rank of sergeant at the sheriff’s office after five years on the job. 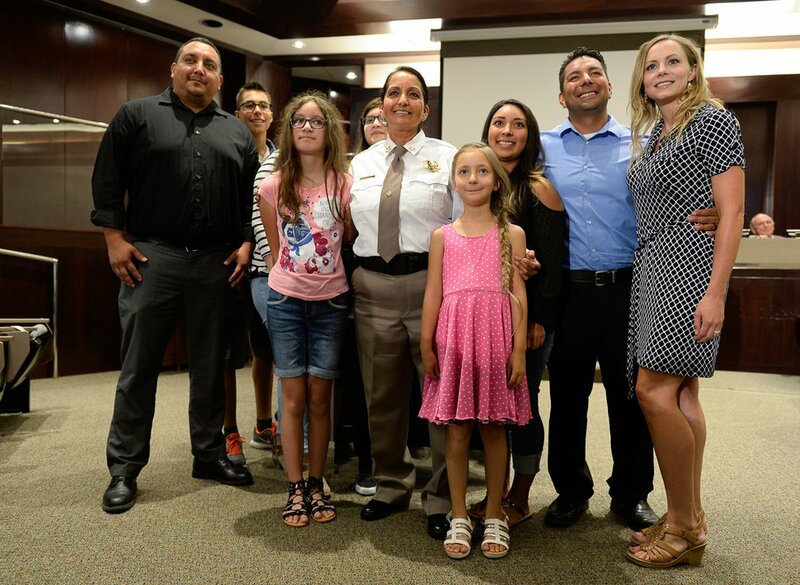 (Francisco Kjolseth | The Salt Lake Tribune) Rosie Rivera is joined by her family for a group photo after being sworn in to lead the state's largest law enforcement agency as county sheriff at Salt Lake County Chambers on Tuesday, Aug. 15, 2017. Rivera becomes the county's first female sheriff and the only woman overseeing a sheriff's office in Utah. At home in Riverton, she had two growing kids — Damian joined the Air Force at 17 — whom she was rearing on her own after her marriage crumbled. Her kids, Rivera said, never complained and never wanted her to quit. Asked about their mother, the cop, the Rivera children have nothing but pride for the job she’s done at home and in the field. For the most part, they said Rivera taught by example, instilling in them the value of hard work and the principles of integrity, service to others and owning up to your mistakes. As for the perils of police work, they said, it was rarely a topic of conversation around the dinner table. “She’s in it because she wants to help out, all of the time,” he said. For her part, Rivera said she didn’t initially plan to run for sheriff, but was persuaded by the encouragement from many corners of her life. “I decided that whether or not I got it, that door was open and I had to walk through it,” said Rivera,who is a founding member of the Utah Women in Law Enforcement Association. She also felt her father’s influence, pushing her through the door with his steady message: You have to be willing to take a chance and be willing to fail in order to succeed. 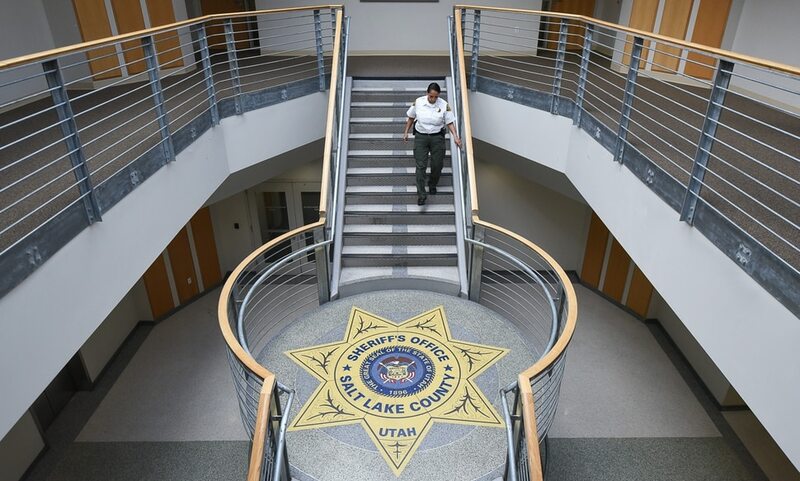 Rivera’s appointment is a boon to female officers — whether they are veterans or new recruits — and offers an encouraging sign about the future of law enforcement, Salt Lake City Sgt. Michelle Ross said. Like Rivera, the 52-year-old Ross faced more than a few barriers in pursing a career in a male-dominated environment where many questioned whether women were fit for the job. Similarly, state Rep. Rebecca Chavez-Houck, D-Salt Lake City, sees Rivera’s advancement as a plus for Utah minorities, who often don’t see themselves reflected in the state’s top leaders. Rivera will change the perception for many, not just because of who she is, but because of the challenges she faced and overcame, the lawmaker said. Rivera hopes to keep the sheriff’s job beyond the year left on her current term. In November, she launched her campaign for the Democratic nomination for sheriff in 2018. She’ll be challenged by one of her own employees: Lt. Justin Hoyal, whom Rivera recently demoted from a chief deputy post to the lieutenant in charge of UPD’s dispatch center. Hoyal is running as a Republican. So far, the two candidates seem to share many similar concerns — jail overcrowding, mental health and drug treatment access along with the well-being of officers and staff — and, in the end, voters will decide what type of leader will best ensure public safety. No matter how long she remains in office, Rivera said, she hopes residents will see her genuine desire to serve and protect every corner of Salt Lake County.